Gifted German theorist, mathematician, printmaker, engraver and painter Albrecht Dürer made a name for himself across Europe while only in his twenties. What set him apart were his woodcuts, which were of very high quality. Today these are called master prints or in German, Meisterstiche. Due to his European influence and reputation, he was regarded as the greatest among the Northern Renaissance artists of his time. Albrecht Dürer was born in Ajtós on May 21, 1471. His father was a goldsmith and a very successful one. Dürer’s body of work was varied. He created numerous copper engravings, self-portraits and various portraits, religious works and several altarpieces. While he immediately gained wide acceptance due to his woodcuts, Dürer was also a very skillful landscape artist, using watercolor as his medium. In fact he was one of the first landscape artists in Europe. It was probable that Anton Koberger, Dürer’s godfather and owner of 24 printing presses used some of Dürer’s woodcut illustrations for one of the most well-known publications, the Nuremberg Chronicle. He introduced classical motifs into the art prevailing during his time via his knowledge of German humanists and Italian artists. He reinforced that with principles of ideal proportions, perspective and mathematics. Although he learned the basics of goldsmithing as well as drawing from his father, his talent for drawing was enough to convince his father to allow him to apprentice with Michael Wolgemut in 1486 when he was 15 years old. He completed his four-year apprenticeship and took the Wanderjahre (gap years) and learned from other artists in Northern Europe. He returned to Nuremberg in 1494 and married his fiancée, Agnes Frey. Three months after he got married Dürer left for Italy and produced several watercolor sketches of his Alpine adventure and ended up in Venice to study its more advanced art styles. During his stay in Venice he was influenced by the works of Lorenzo di Credi, Mantegna and Antonio Pollaiuolo among others. Men’s Bath House that was done circa 1496. His woodcuts became larger and more complex than his previous works. They also showed balance in the composition of the elements. Art historians now think that Dürer did not cut the woodblocks himself but had a specialist do it for him. But some argue that he had the training and had actually produced painted and carved altarpieces. It was thought that he either glued the drawing to the wood block or directly drew the design onto the wood. Late in the 15th century, Dürer created his series of 16 designs for the Apocalypse, the St. Michael Fighting the Dragon woodcut, the first seven of the scenes for the Great Passion and a series of 11 engravings consisting of saints and the Holy Family. At the turn of the century Dürer and his assistants created the Seven Sorrows Polyptych for Frederick III of Saxony. Very early in the 16th century he started the first 17 works that chronicle the Virgin’s Life. Always eager to learn, Albrecht Dürer also taught himself the art of using a burin (engraving tool) that was very difficult to use. Mastering the art, he created the Prodigal Son in 1496, which was highly praised by Giorgio Vasari, the Italian Renaissance art historian. By 1498 he had finished The Sea Monster, created Saint Eustace in 1501 and produced Nemesis in 1502. He was also creating watercolors during this period, which were quite different from his earlier watercolors. His prints though were more sought after. Dürer learned a lot from Jacopo de’ Barbari, a Venetian artist who visited Nuremberg. 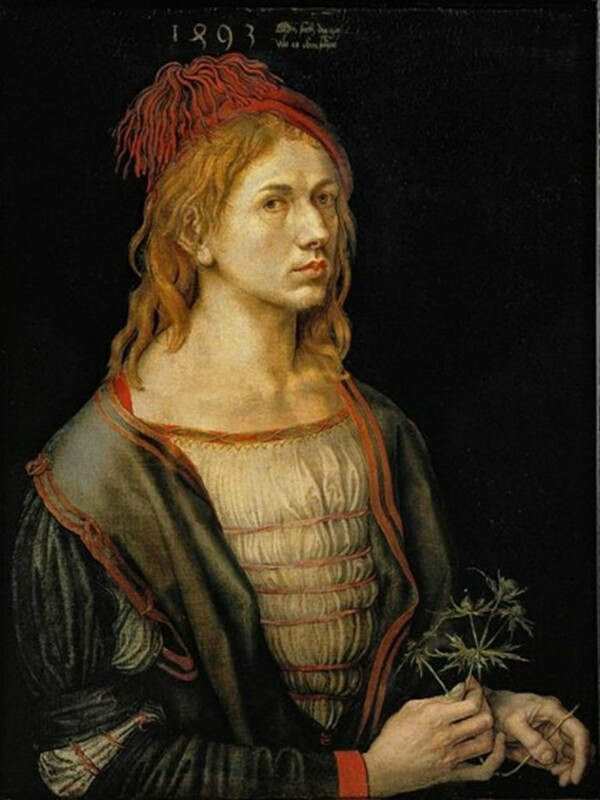 Through De’ Barbari Dürer learned about the developments in proportion, anatomy and perspective, although De’ Barbari was not willing to divulge all that he knew. Dürer studied on his own and experimented with the proportions of the human body, resulting in the beautiful engraving of Adam and Eve, which also showed his mastery of the burin. Adam and Eve is the only extant engraving that bears the full name of Albrecht Dürer. Albrecht Dürer was one of those artists that made preparatory drawings, which was a good thing since many of these survived. 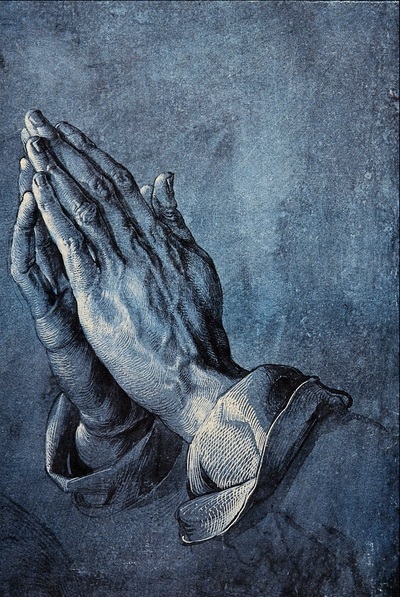 One of the most famous among the studies that he had done was a gray and white pen and ink drawing of an apostle’s hand, called Betende Hände or the Praying Hands, which is one of the most popular and most reproduced work of Dürer. While he was in Italy, Dürer also created several painting, using tempera on linen as his media, such as the Adoration of the Magi and the Paumgartner altarpiece, the Adoration of the Virgin or the Feast of Rose Garlands, Christ Disputing with the Doctors and The Virgin and Child with the Goldfinch among others. He was highly regarded in Venice and was on friendly terms and regular communication with other Renaissance artists including Giovanni Bellini. Raphael and Leonardo da Vinci (through Loreanzo di Credi). Other celebrated paintings of Dürer include Adam and Eve, Adoration of the Trinity, Assumption of the Virgin (altarpiece), Virgin with the Iris and The Martyrdom of the Ten Thousand. He was also able to complete the woodcut series called the Life of the Virgin and the Great Passion in the early part of the 16th century. After he returned to Nuremberg from Venice, he began to apply chiaroscuro effects to his woodcuts, which created a mid-tone that greatly accentuated the contrast between the shadows and the highlights. This period also saw Dürer completing 37-woodcut series he called the Littte Passion and 15 smaller engravings of the same subject. Between 1513 and 1514 he created Knight, Devil and Death, his most famous engravings as well as Melencolia I. In his last important journey he travelled with his wife and went to Cologne and Antwerp where he also created several works in charcoal, chalk and silverpoint. He also went to Ghent where he closely studied the altarpiece created by Jan van Eyck. Albrecht Dürer died at the age of 56 in Nuremberg. His large house has now become a landmark in Nuremberg and has been turned into a museum.